Gathering resources plays a crucial role in our player-driven economy. Nearly everything that’s built and crafted in the world of Albion is based on resources you gathered – or, in the future, gathered by some of the laborer non player characters. Not really, no. For one thing, your laborers won’t be content if you just hire them, and then send them off with a journal to work for you. They will become unhappy. To counter that, you will need to provide them with appropriate furniture. An appropriate bed, a spot at a table and a place to sit is something that everyone of them wants. And appropriate means, that a master gatherer will not be content with a broken wooden stool. If you manage to cater to their needs, their happiness goes up. And, as in the mythical world that lies beyond the shores of Albion, a happy laborer is a productive one. That means, in turn, that a happy laborer has a better chance to bring you more stuff – which is something you most likely want. As your hirelings work for you, they naturally gain fame – just as you yourself do, as you move through the world of Albion. Whenever they become more proficient, they also become more demanding – and want better furniture. In turn, they offer you higher level journals, that makes them gather better resources. Your new workforce naturally must be hired. 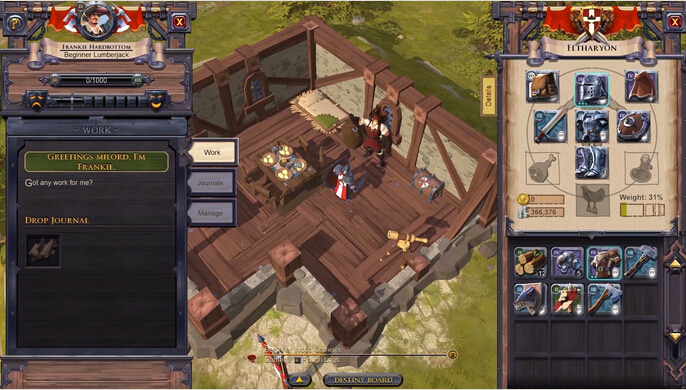 You can choose between the gathering professions, a mercenary or one of the four crafters. After paying a certain fee in Silver, you can choose a spot for your newly hired laborer in your player house or in a guild hall – how many you can hire depends on the size of your building. After a little while, they will have settled in and you can put them to work. They will offer you a journal related to their profession, for example a woodcutting journal. Your avatar in the world uses this book to write down notes for the laborer. After you have acquired said journal, you head out into the wilderness and start working – like chopping wood. While you are chopping wood, you naturally gather fame – and at the same time, your journal automatically fills with notes for your laborer. Once it is filled, you can head back to your hireling to hand it in. After you have done that, he will leave for work. After eight hours, he returns and brings you some resources of his profession – naturally not anywhere as much as you yourself could have gathered, but it will be a nice little bonus. Gatherers will, well, gather stuff. The mercenary brings you mainly Silver, the crafters give refined resources like metal bars.